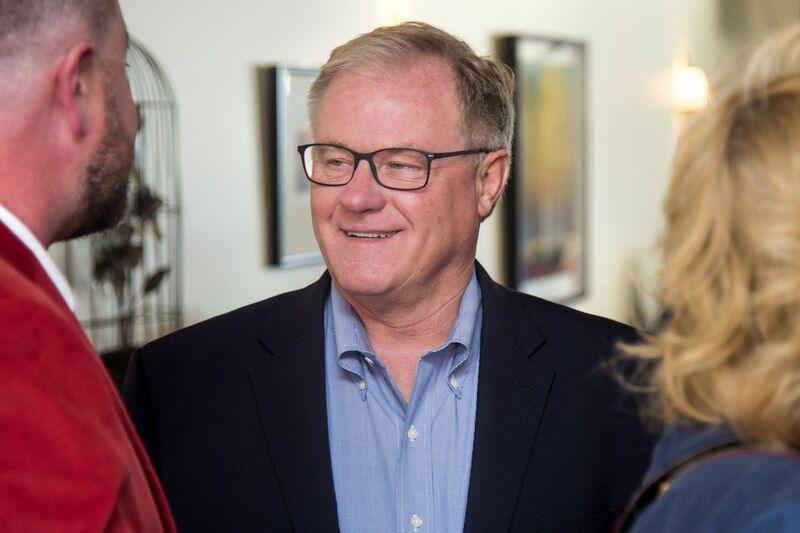 Scott Wagner, Pennsylvania's Republican nominee for governor, doesn't have much of a filter. That's what energizes his supporters and detractors alike. "I say things maybe I shouldn't say," he said during a heated discussion with the Inquirer Editorial Board in May. "But at the end of the day, I'm not afraid to say things. I have an opinion." Scott Wagner cast himself as Trump-like in his run for Pa. governor. Some Philly-area GOP donors aren’t feeling it. It was no different Wednesday night at a VFW hall in Glenside, Montgomery County, where Wagner held a town hall-style meeting. He's running against Gov. Wolf, a Democrat seeking a second term. About 40 minutes into the program, a young woman told Wagner she was "really concerned about the future of our country." "You've said that climate change is a result of people's body heat, and are refusing to take action on the issue," said Rose Strauss, 18, a volunteer with Sunrise, a political group focused on fighting climate change. "Does this have anything to do with the $200,000 that you have taken from the fossil fuel industry?" At first, Wagner responded like many polished politicians would: "Rose, I appreciate you being here." Then he added, to laughter and applause, "You're 18 years old. You're a little young and naive." "Are we here to elect a governor, or are we here to elect a scientist?" Wagner continued. "I'm here to be the governor." He said "climate change is important" and then pivoted to the prevalence of sinkholes in Harrisburg and the city's aging infrastructure, which he said was causing raw sewage to contaminate the Susquehanna River. Wagner said that issue was more important to him than climate change. An activist named Sean Kitchen recorded the encounter; his video had been viewed more than 10,000 times on Facebook as of Thursday morning. The Pennsylvania Democratic Party said Wagner's remarks were "insulting" and showed he wasn't fit to be governor. But Wagner's supporters in the audience cheered him on. One supporter wrote on Facebook: "Thanks for giving an honest answer instead of some kind of wimpy/politically correct one." Wagner tends to engage in these kinds of exchanges; a tracker with the state Democratic Party once filmed him describing the liberal billionaire George Soros as a "Hungarian Jew" who has "hatred for America." To be sure, Wagner can modulate his tone when needed. Later during Wednesday's town hall, he took a question from a single mother who said she was worried about child support for her adult child. He expressed empathy for her situation. "There is a softer side of Scott Wagner," he said.